Whenever you are in your journey through Iran, it is recommended to participate in this unique nationwide event. Late last days of winter, when the land is getting warmer, waiting impatiently for spring to come, to spread its velvet green skirt with flower buds over the Iranian plateau, People begin to get ready for the coming of Nowruz. Since the unknown time the end of coldness always has been coming with several celebration and rituals to praise the rebirth of nature. It is called "ChaharShanbe Suri", the most prominent rite sits as the arrival step of spring, on the last evening of Tuesday. "Chahrshanbe" means Wednesday in Farsi and about "Suri", there is a potential fact refers it to reddish tint regards to a healthy fresh facial expression. Countrywide people gather to make bonfires in the streets, alleys, courtyard and roofs before jumping over the flames: this is considered a ritual of purification before entering the New Year to come. Are you interested in celebrating Chaharshanbe Suri with local people in Iran? Whenever you are in your journey through Iran, it is recommended to participate in this unique nationwide event. According to your own itinerary, we will provide you with the best and most authentic places to experience these traditional festivities among locals. Spend an unforgettable evening with Iranians at nightfall to enjoy knowing about ancestral stories of Iran, setting fire the way you had never done, singing folklore melodies, observing native dance and being in an experimental live transmission. Fire and water have been the most sacred elements in ancient Persia and even now. "Gathha", the venerable book of Zoroastrians written by Prophet Zoroaster, mentions about 6 days before Nowruz, the Persian New Year, there is festive of descending the essence of bless. Although fire is the most holy element for Zoroastrians, yet there is not a string between Chaharshanbe Suri and the first monotheist religion of Persia. Some believe this ceremony relates to the announcement of New Year with setting fire over roofs or in another direction, it can recall the story of "Siyavash", the mythical character of "Shah Nameh", where the fire became his examination to ride through its blaze to prove his innocence appearing unharmed. From nun-ritual aspect, fire had the usage of sanitary in New Year customs for sterilization. Throwing the time-worn jars away was a common tradition in this event. Sassanid kings used to bring fire wood in strategic and sacred places to clean contamination from them. Nowadays, this festival is still observed in many neighboring countries of Iran, such as Turkey among its Kurdish residents, Azerbaijan, Iraq, Afghanistan, Tajikistan. This celebration is one of the most appreciated rites by Iranians, who gather on the eve of the last Wednesday of the year, in March. Before entering the New Year, this ritual is a chance to get rid of its personal misery or sorrows, in order to start a new and fresh beginning. 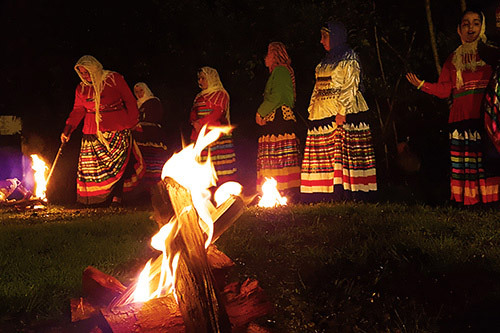 Although jumping over fire came later to be a part of Chaharshanbe Suri but it is now the first function of ritual comes to mind thinking about Chaharshanbe Suri. While jumping over the fire several times, people shout "Zardi-ye man az to, sorkhi-ye to az man", This sentence literally means "My yellow pale figure be yours, your lively red be mine", which expresses the wish to exchange one's pallor and problems against the redness, warmth, and energy of the fire. The interesting is each region of country has its original statement in their native accent for this honorable jump and even for calling Chahrshabe Suri. In Gilan people say "Gule- Gule Charshambe", Isfahani fellows call it "Charshambe Surkhi". 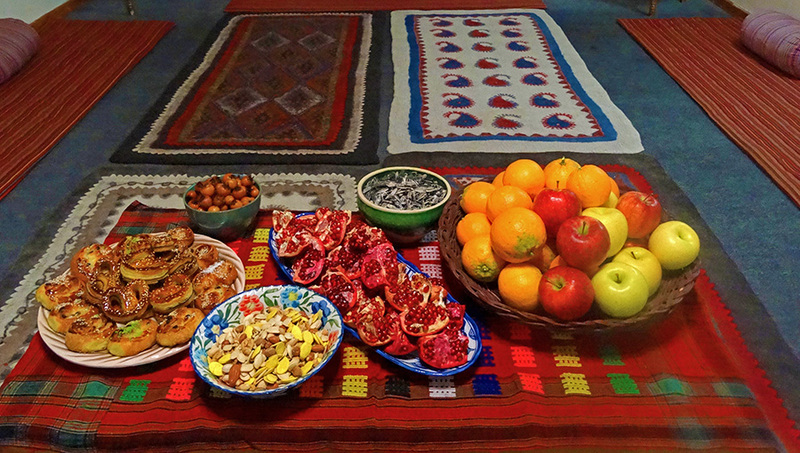 Another tasteful tradition during Chaharshanbe Suri is to eat a special mix of dried nuts, fruits, and sweets. People believe it will help their dreams and wishes come true. They also prepare a delightful and specific kind of "Ash", a traditional Persian noodle soup. 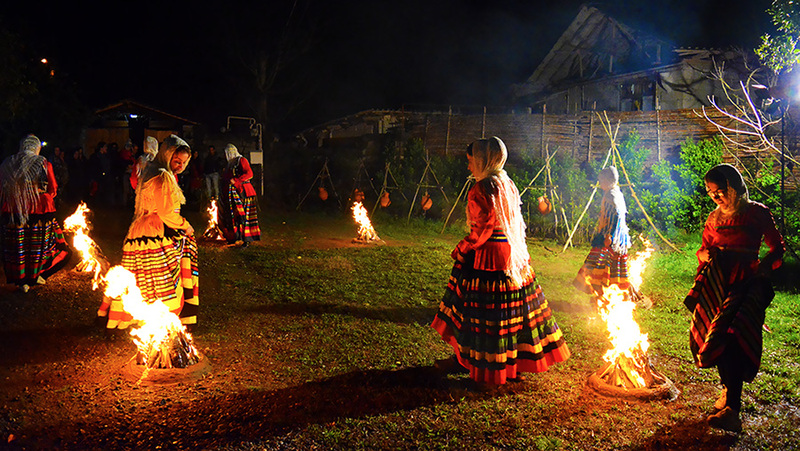 The Fire Festival has also many other aspects and rituals, which tend to disappear but can still be witnessed in rural areas. One of the most pleasant ones is a reminder of Halloween's trick-or-treat: "Ghashogh Zani", or "Spoon hitting". At nightfall, people specially unmarried girls wear disguises and go door-to-door to hit spoons against plates in order to receive some treats. Another lovely ritual is called "Kuze Shekani": local people throw a jar containing the dust of fire or salt and coins from the roof of their house. By breaking down on the floor, it symbolizes the destruction of the year's bad lucks. There exist several other celebrations such as "Gereh-Goshaee", "Fal-Gush Neshini", and "Shal Andazi" which express the hopes for the New Year to come.